The sample packs I’ve been handing out the last few days, in Ableton Live drum rack format, free of charge! Edit: Beware though, this Drum-Rack only works in Ableton 8.2. Thanks Tomas for sharing! But you can still use the samples found in the download. 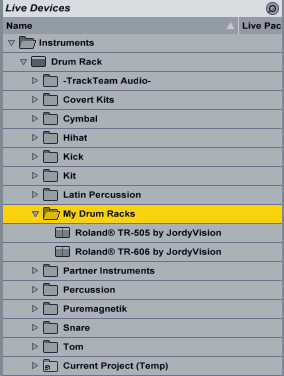 You can make your own folder within the Drum Rack folder if you wish. Most of the time I call these “My Presets”, “My Patches” or something along these lines, pick any name you’re comfortable with. If Ableton gives you a “Samples couldn’t be located”, then let Ableton search the library and they should pop-up. Feel free to ask for help in the comments. That’s it! Enjoy your vintage drumming. 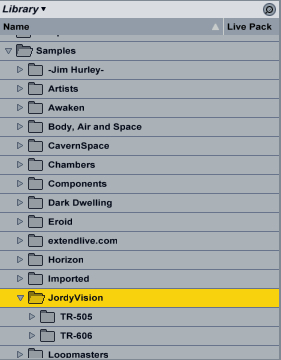 Roland TR-505 Sample Pack & Roland TR-606 Sample Pack by JordyVision / Son of 8-Bits is licensed under a Creative Commons Attribution-NonCommercial-ShareAlike 3.0 Unported License. Permissions beyond the scope of this license are available at http://sonof8bits.com/about-me/contact. This is a Creative Commons release, however, commercial use is allowed through a license. A license is free, but registration is required. Go to http://sonof8bits.com/about-me/contact for said license. Make sure to include your full name and a valid e-mail address. More samples? On this page.